T-shirt Quilt........it is FINISHED and BEAUTIFUL!!!! FInished the t-shirt quilt I have been working on. It is 60x60 in size. 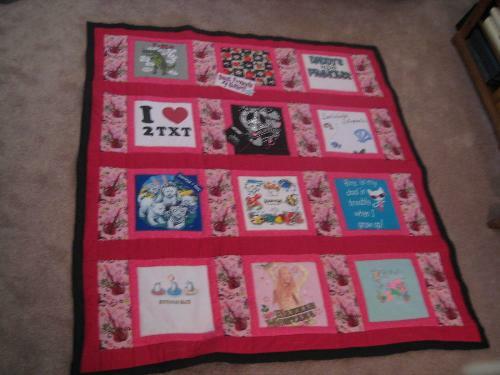 The t-shirt blocks are 9x9 monted on a pink 12x12 square. Middle strips are 12x4 and the outer pink strips are 2x12 and the black binding is 2 inch. The back is fleece in black with the same guitar print as the pink print on the front side, just black background instead of pink. Fleece is fuzzy and soft. I know she is going to love it. Each square is a t-shirt that meant something to her. THe dino one at the top is from her dinosauar phase and also one I gave her. The next one is a piece of fabric from an outfit I made her that she loved and insisted on wearing when she came to my house and wanted to play outside. Daddy's Princess is just that. I (heart) 2 txt - now a days, she loves to text! The black on in the middle is a t=shirt she liked but more for the style with the sparkles and all...but it is from her favorite store Justice (used to be Limited 2) She loves clothes from that store! I use the label from the back of the shirt that says "Justice" on it pointing out that it is her fav store. Next one is from her days as a Brownie..and they spent the night at SeaWorld and one of the activities was to paint the t-shirt. Blue with white tigers..she went to see the White TIgers at the Sigfrid and Roy show in Las Vegas..didn't see the show but did see the tigers and she loves big cats and wild animals. Aquarium of the Pacific is a fav place of hers..this one just says that in the middle and has marine life around it and she loves marine life..wants to be a marine biologist when she grows up Then one that say "Boy is my daddy gonna be in trouble when I grow up" only cause she is so cute and [pretty and a real jaw dropper when she was little and will be as a teenager! Bottom row is her and her mom's favorite beach..Huntington Beach. THey went there all the time. Next...no pre-tween is a pre-tween without Hanna Montana in their lives for a little while! Final square is another Aquarium of the Pacific..but this one is about mermaids...and she was into mermaids for some time! So her memories, her life and I did it on a quilt for her. First quilt I have done in about 15 years...took some time to figure it out as I didn't follow any pattern other than the size of the t-shirt fronts were my beginning size and I built up from there. I am proud of it and have another one just like it (in purple) nearly done for my other grand daughter. She is only five so t-shirts for her are scarious, but we'll see how it goes! I have some plans for it! That part is easy ElicBxn....I cut out the front of the t-shirt to the size needed to include the full design, then cut IRON ON INTERFACING the same size and then iron it on the back of the t-shirt square. Works perfectly and is very common in quilting...mainly for applique quilting (which is my favorite style of quilt to do). Just doing regular squares and triangles kind of quilts doesn't require the interfacing stability as they are so small...but with the t-shirt...not only do you have to accomodate the stretch of the fabric (it can't stretch anymore once on the quilt) but it also helps with the stability of the double knit of the fabric...again, can't stretch but needs some strength to it. So just get some iron on interfacing and go to town! Quick and easy. I cut all the t-shirts fronts, then cut the same number of interfacing squares and then iron them all at once and then the quilting can begin! It is really easy and quick. Now when you sew the t-shirt square to the block strips that fabric is now the same stability and strength as the block strips (which should be a cotton or cotton/poly blend (100% cotton is best but I have trouble finding it!) it is sewn to. IN this case tho...since I was using the thinner medium pink...I just qppliqued the t-shirt square onto the larger cotton square. I could have just sewn the thin strips to the sides of the t-shirt square, but thought that'd be to thin and look funny if anything "pulls". In this case..use light weight interfacing. If you are using the square on it's own...get medium weight interfacing. Your horse t's sound like the perfect T-shirt quilt makings! 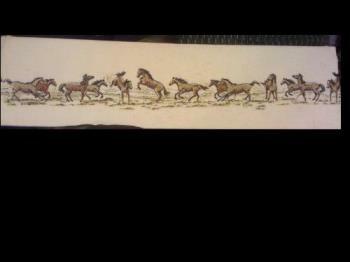 Dependig on the height of the horses themselves....you might could cut it to use just the horses as a border strip along the top or bottom of the quilt. Or an Inner Strip connecting the blocks. This is a fine document and a truly beautiful object. I'm certain that your grand-daughter will love it and treasure it and that it will mean so much to her as she grows older. I sure hope she'll come to understand not only the love that you put into it but also its historical significance. In 100 years time, where (I wonder) will all those t-shirts be? Probably nowhere, unless they have happened to be made into quilts and other things which people have treasured! I first read your description all the way through and only then looked at your photo. At first, I have to confess, I thought the idea rather 'klutzy' (especially when I read that you had used a pink background) but when I saw your photo I completely changed my opinion. I think it's a work of art and your choice of three different shades of 'pink' is in the finest taste and perfectly done. I hate girly 'pink' and I wish we could call it something else. In fact, 'pale rose', 'rose pink' and 'old rose' would be what I would call the colours you have used ... but maybe I'm old fashioned, myself! I'm only a mere man (albeit a grandfather) and I don't think I could ever make a quilt in a million years. I do love art, however, and especially art which tells a story. I think you have created something very special and unique. Thanks so much owlwings...I am not a pink person either, but she is! She likes neon pink and deep, but bright pinks....not pales! So these colors are medium pink block and a darker pink strips. The hardest part of doing anything like this for me is matching the colors. I swear..it takes longer for me to find and match colors than it does to construct the product!!! But her other fav color is black and she is a tween so the guitars and "rock" I thought fit her well. And it was absolutely unexpected that I found the guitar print in pink and that same pattern in the black for the back! I think I "hoorayed" in the store when I found it! She is alot like me..I know this will amaze her and she will love it. She is quite sentimental too! I have nothing from my family's past and it always bothered me that no one saved anything! I had grand parents that could have and they didn't. Even my own folks have nothing to "pass down". So I wanted that for my kids. But with moving so many times and life just being so mobil, other than a few jewelry things, I haven't anything sentimental to give them. So I swore I would give to the Grand kids so they have soemthing of their childhood...the memory of me is an extra add-on! And I to..love art with a story. I am really proud of these quilts and the story they will tell...maybe one day to a great grand child! There are done with a sewing machine...even I don't have the patience to do them by hand! I have seen and admired some of those geometric American quilts. I never really thought about them being made by hand (but, of course, they must have been). They were made, I am sure, mostly by very busy housewives with very little spare time and, no doubt, mostly by the light of an oil lamp. The hours spent and the workmanship required is very often taken for granted when we see these things in a museum. Yes they were made by hand and lots of work...a Quilting Bee...that's when the towns ladies would all get together and stretch out the quilt on a frame and everyone would get around it and hand sew the quilt together. I would love to do one of those! I tried hand quilting and it is hard, tedious and time consuming! But they did it "back then" cause they had to! And they needed blankets and it was usually made out of rags and old clothes that couldn't be worn anymore, things like that. They were so good at useing everything they had! I admire the pioneers so much for what they did, that is seldom mentioned. Especially the women..they had to make ends meet when there wasn't any ends to use! They didn't get the nice bolts of fabric to choose from like we do! And they created the patterns and made it all fit and be beautiful. When I do see a hand sewn quilt...I always look at the stitching and see how small (tiny even) they are and just imagine and think boy that woman did some amazing work...don't think I could have done it! But then we are spoiled with machines now! That is so cool! I bet she will just love it! My sister did one for a friend of hers.....for her sons graduation....he also loved it and was so appreciative!! A boy that loved a quilt...that is cool in itself! I can't wait to give it to her! That looks just wonderful. It makes me wish I had a talent for that sort of project. But I don't so I will just wait for the next one. Seems like an enjoyable labor of love. It isn't exactly hard...just time consuming. The hardest part for me was designing it! I am terrible with putting colors and prints together. Go figure..that is a major must have in crafts, and with all the crafts I have done my lifetime...I some how never accomplished that task! But I spend more time designing it that I do actually sewing it! Wow! That's a lot of work and it sounds awesome. Thanks Ambiepam...yes lot of work but the hardest part for me in anything I do like this is matching the colors! I spend more time trying to figure that out than it takes to sew it together! Always been that way for me! Don't know why as I was raised on crafts and putting color together! Been sewing since I was 10...for me, my kids, others etc...and stlll to this day have to fight to figure which colors go best! That's nice and really beautiful.The color was just right.Your so good in doing that.The details and design is great.Do you have more of this? Thank you! I am currently working on a similar one for my other GD..she is 5 and I have been collecting t's from her too, but short a few due to age. I don't want to wait any longer to make this as I might be out of the "mood" to do them in later year...so I came up with a strategy... I needed 12 shirt blocks. I had 8 t-shirts. So for the other squares...I used fabric of things she loved at her young age. Last 2 years she's really been into the DIsney princesses..so I got a piece of fabric with all the 5 princesses on and used that in place of the t-shirt front. Another one was a block from her cousin (the one this quilt is for) the two of them are really close nad have a thing they call "kellie kamp" where the older one teaches the young one things and they kind of play school. So I took a piece of solid pink, and we wrote out a little note from her and I printed it out onto the fabric, then at the top with fabric paint titled it Kellie Kamp and then she decorated it with flowers. THis one is from her best friend and also the memory of their fun time playing school. Another block was a square of the fabric I used to make her first dress...that she loved. I ran out of ideas, but the thought, instead of putting my "label" on the back, I'll make it into a block! So I wrote her favorite song I used to sing to her and printed it out onto the fabric (or iron on prodedure) and the only thing I am missin gon that is the decoration. For the other GD I printed out an Orca whale as she loves them..but gotta gome up with something for this one. It is construted the same way, just with light/dark purple. I'll post it soon as I get it done.I made the pattern and construction up myself. Oh, the backing is fleece with Tinkerbell...age 2 she lOVED Tinkerbell and still is rather partial to her! It is all about them and that made me happy to make it. What a lovely idea, I tried doing quilting some years ago but I am not good at sewing, you have done a lovely job on that and I am sure it will be a family heirloom, very nice. Thank you! I sure hope she keeps if for that reason! After I am gone, she can say I made it for her and remember our good times we had. She and I are very close. It is machine quilting too...not by hand! Wow, how pretty, you did an awesome job. Thank you. Can't wait to get my grand daughters reaction! What a beautiful work of art, an amazing keepsake for a special little girl! I was thinking of making something like this for my son. Every year I keep something from his clothes that I just can't part with!! This would be perfect!